OK, so I’ll admit it. I cry when I see Olympic gymnasts. I also cry at the tender parts of movies, and sometimes just listening to music brings me to tears. I think it’s a beauty thing. I am moved by excellence, by goodness, by beauty. Beauty is a powerful force. We are drawn to the beautiful. We surround ourselves with beautiful things. We soak ourselves in beautiful music. Indeed, when we consider another person beautiful, we call that person “attractive.” Furthermore, beauty is something we seek to imitate. Artists and poets learn their craft by by reproducing the styles of the Masters. 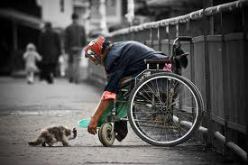 When we see beautiful acts of kindness or tenderness, we are inspired to do likewise. And here I have lamely related to you the uneventful chronicle of two foolish children in a flat who most unwisely sacrificed for each other the greatest treasures of their house. But in a last word to the wise of these days let it be said that of all who give gifts these two were the wisest. Acts of radical generosity are attractive, I think, because they are extravagant examples of the human calling, the very purpose for which we were put on earth. We were made, “to take care of ” our garden earth (Genesis 2:15). We were placed here to give ourselves for the benefit of both people and planet in the presence of our loving Creator. When we hear a story of generosity we see a vivid model of the beauty of human purpose itself. Luke tells of a similar story in the book of Acts. He recounts how the Holy Spirit descended upon a gathering of followers of Jesus and how they were transformed. Near the end of his account Luke declares that “All the believers were together and had everything in common. They sold property and possessions to give to anyone who had need” (Acts 2:44-45; see also Acts 4:32-35). Luke’s point here is to describe the generous beauty of a community filled with the Spirit of Christ. In his gospel, Luke earlier told the sad story of the rich young ruler who would not redistribute his wealth to the poor and follow Jesus (see Luke 18:18-29). The beautiful life of radical generosity, which the rich young ruler could not enter, is a life which the Church exhibits characteristically. It is attractive. It is contagious. As I write this, it is early morning, New Years Eve. The US government has still not resolved the issues necessary to save us from our “fiscal cliff.” Let me offer a suggestion. If the Christians of this country–only the Christians–were to choose to imitate the beauty of the radical generosity modeled in the Scriptures, our country (and the image of the Christian faith in the eyes of onlookers everywhere) would be transformed. Let’s choose to live a beautiful life.